When she was young, Julia's Grandfather used to secretly time her to see how long she could actually sit still before she had to get moving again. (a record of 2 min. still stands). Now, with multiple Junior National Championships and a Junior World Championship medal under her belt, it's not hard to see all that movement and energy has paid off for Julia. Growing up a multi-sport athlete and general outdoor enthusiast, Julia recognized, variety is the spice of life and key to keeping things fresh when training and competing at the highest levels in a sports. She surfs, hikes, mountain bikes, climbs, runs, and has pretty much played most sports know to man. And this has helped to compliment and enhance her focus and dedication to the sport of Nordic skiing. 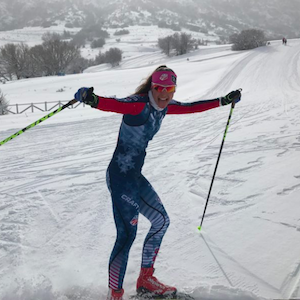 She, and fellow Pro Ambassador Katherine Ogden, were part of the US Junior World team who won the bronze medal in the relay at the 2017 Junior World Championship. She currently attends Dartmouth College, is a member of the SMS T2 team, and, according to social media, looks to be having the time of life training with teammates, hanging with friends or generally just being Julia Kern.